Ben Miller's blog on Wi-Fi sniffing. Surveys, analysis, security and whatever else. So sayeth me, my relatives (one of whom will receive my old iPhone), California (who will receive 8.75% in sales tax on the FULL UNLOCKED PRICE of the phone because California has a ludicrous sales tax law that taxes the pre-discount price of mobile phones) and anyone else who has been waiting for the iPhone to finally support 5 GHz WiFi. But wait, there's more. The iPad has long supported 5 GHz 802.11n WiFi, but the iPhone 5 does the iPad one better. How? Read on, amigos. Though Apple's most popular iOS device, the iPhone, has eschewed 5 GHz WiFi until iPhone 5, iOS-based access to 5 GHz channels (numbered 36 through 165) has been available in every iPad model. The iPad has always been 802.11n, which is good. But the WiFi adapter in the iPad has always supported the bare minimum 802.11n, which is bad. (Specifically, 65 Mbps Data Rate bad.) This meant that an iPad is going to take about three times as much channel time as a MacBook Pro (which has a top data rate of 450 Mbps) to send or receive a single full sized packet. In supporting the 450 Mbps data rate, the MacBook Pro supports the following additional 802.11n technologies. Along comes iPhone 5. It is better than the iPad, but still a ways below the MacBook Pro. The iPhone 5 uses the 40 MHz channel bandwidth and the 400 nanosecond guard interval, but not 3 stream multiplexing. That means a top data rate of 150 Mbps. Why would the iPhone 5 not use 3 stream spatial multiplexing? Because spatial multiplexing of any kind involves using multiple input/multiple output (MIMO) technology. MIMO drains battery life (because it involves multiple transceivers being used instead of one), it can lead to heat issues (same reason) and it is hard to do on a small, slick-looking device (because each antenna that is attached to a transceiver has to be at least a half wavelength from each other antenna). The bump in maximum data rate to 150 Mbps means that an iPhone 5 at top speed will be sucking up a little bit less than twice the channel time that a MacBook Pro would be if both are sending or receiving full sized packets. Still less than ideal, but a whole heck of a lot better than what we used to have. In some circles, Apple Wi-Fi devices are knows to have problems with lost connections. iPhones and iPads will unexpectedly miss incoming calls, have delays in receiving push notifications and even be forced to reauthenticate. Some Apple Wi-Fi connection problems stem from Apple iOS devices' use of 802.11 power management. To understand what Apple devices are doing with power management, one must first understand how 802.11 power management works. The last Sniff Wi-Fi post; on why Wi-Fi professionals should stop disabling low data rates, was met some resistance. Be it in the comments or on Twitter, several experienced Wi-Fi folks disagreed. All arguments in favor of disabling low rates (the ones that were presented to me, at least) were refuted in the text of the Leave, Leave, Leave My Rates Alone blog post. But text is a less accessible messaging method. "A picture is worth a thousand words", as the old saying goes. If pictures will get the message across better, then pictures are what I'll use. What follows is an illustrated look at why disabling low data rates is a bad idea. 1. 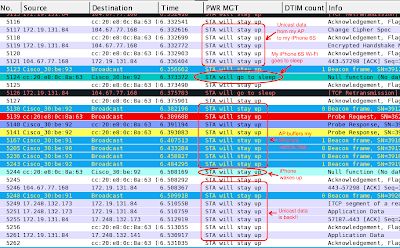 Wi-Fi devices -- not APs -- control associations and roaming. Editor's note: In the original publication of this article, the relationship between Wi-Fi channel width and SNR was described imprecisely. 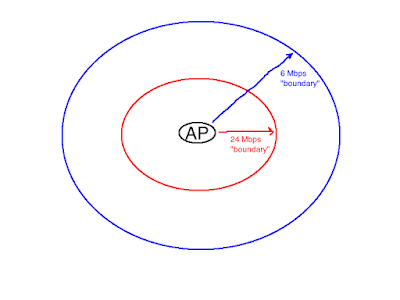 While the point of the article was correct -- that wider channel widths increase the likelihood of Wi-Fi frame failures for mobile client devices -- the mistakes have been corrected. Thank you to Adrian Granados. Ahh, roaming. Few things capture the spirit of freedom like the ability to Roam wherever you want to go. Wi-Fi has its own brand of roaming, and there is one aspect of Wi-Fi roaming that often gets overlooked: 40 MHz and 80 MHz wide channels can make Wi-Fi users feel like they've been bounced from the Love Shack. Much has been written and spoken about the pros and cons of the three Wi-Fi channel widths: 20 MHz, 40 MHz, and 80 MHz. 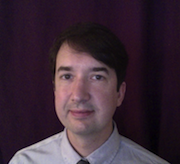 Ben Miller is a Wi-Fi Specialist with experience in training, design, surveying and troubleshooting. He is based in Los Angeles, CA. Ben can be contacted via email at ben@sniffwifi.com.